After the Gala evening of the Ars Electronica Festival on September 3rd, FM4 radio station will provide a musical event in the Danube Park. Various DJs and VJs will be invited play and turn the music into light visualisation on the Ars Electronica Center facade. The event will be streamed online by FM4 and local VJs in other European cities involved in MFF Europe 2010. They will be invited to create simultaneous visualisations for their local media facades. 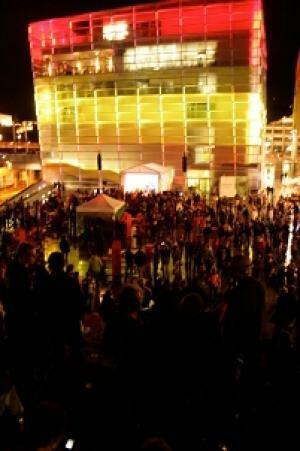 This event is a joint event between FM4 radio station and Ars Electronica. Different artist will be joining.